Khadim Ali reinterprets the ancient Persian poem Shahnameh c977-1010, also known as the Book of Kings, from the perspective of troubled present day Afghanistan and Pakistan. The Shahnameh was recited to the young artist by his grandfather, which has since been appropriated by Taliban fighters to promote and justify their jihad. Ali once related to its protagonist, the warrior Rustum, who tragically kills and is killed by his jealous half-brother Shaghad. However, through personal experiences shaped by civil war, he now also indentifies with the Shahnameh's antagonist demons. 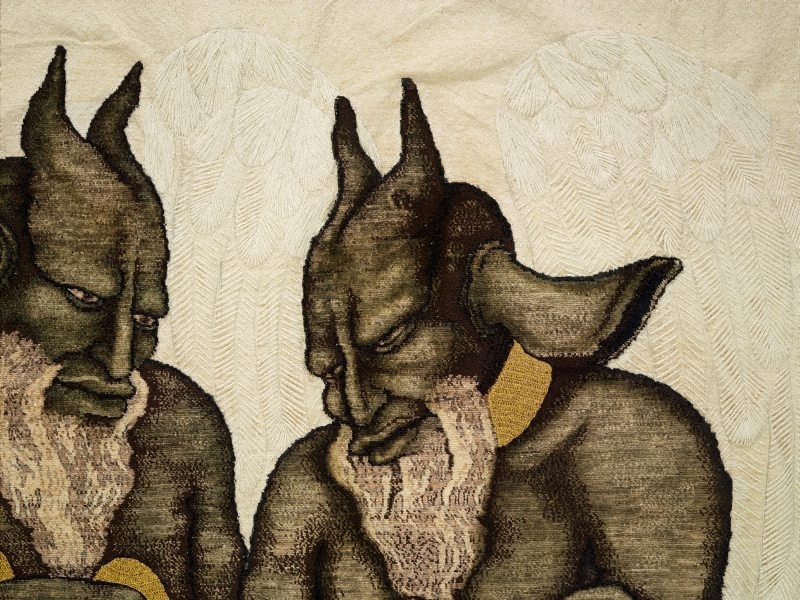 Depicted in an exquisite carpet are two demon characters, portrayed as tubby half human / half animal figures with wings, horns, a beard and goat ears. Their anthropomorphic features and double representation are emblematic of a moral inversion between good and evil, in an imperfect world where heroes fail and villains succeed. 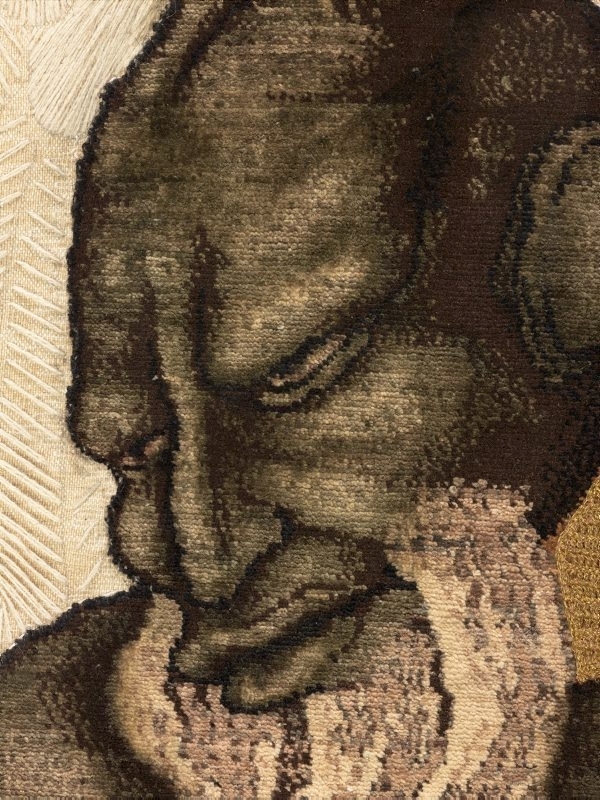 The carpet was created in collaboration with traditional weavers of Kabul, Pakistan. It is a talismanic object that carries great personal and cultural significance to Ali and the Hazara people. In Afghanistan carpets are treasured keepsakes, passed down through families over generations. Ali has recounted how his parents' own carpet was the only possession to survive a suicide bomber's attack on their home in 2011. A craft upkept by Afghan asylum seekers and Afghan people living in exile, it retains links to their history and homeland. © Khadim Ali. Courtesy Milani Gallery. 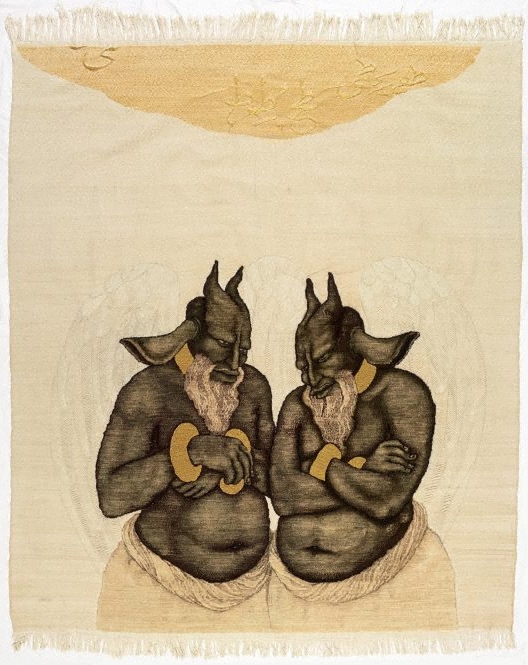 Macushla Robinson and Khadim Ali, Khadim Ali: The haunted lotus , 'Khadim Ali in conversation with Macushla Robinson', Sydney, 2014, n.pag. (colour illus., detail).